Faulty postures due to sedentary lifestyle cause weakening of core muscles which contributes to increased incidence of musculoskeletal disorders (MSDs). Although a few research studies have quantified the core muscle activity in various yogic exercises used in rehabilitation programs, evidence correlating it to functional anatomy is scarce. Such information is important for exercise prescription when formulating treatment plans for MSDs. Therefore, the objective of this review article is to examine the literature and analyze the muscle activity produced across various yoga postures to determine which type of yoga posture elicits the highest activation for the core muscle in individuals. Literature search was performed using the following electronic databases: Cochrane Library, NCBI, PubMed, Google Scholar, EMBASE, and web of science. The search terms contained: Core muscle activation and yogic posture OR yoga and rehabilitation OR intervention AND Electromyography. Activation of specific core muscle involved asanas which depended on trunk and pelvic movements. Description of specific yogic exercise as they relate to core muscles activation is described. This information should help in planning yogic exercises that challenge the muscle groups without causing loads that may be detrimental to recovery and pain-free movement. Knowledge of activation of muscles in various yogic postures can assist health-care practitioners to make appropriate decisions for the designing of safe and effective evidence-based yoga intervention for MSDs. Faulty postures due to sedentary lifestyle contribute to increased risk of musculoskeletal disorders (MSDs). These disorders are mainly due to weakening of “core” muscular network. Consequently, it can lead to excessive load on lumbar spine, poor endurance of muscles, imbalance of hip extensor, back injuries, and instability of lower extremity which may ultimately lead to atrophy of paraspinal muscle., Although MSDs can be difficult to treat, there are many clinicians who report positive patient outcomes with various treatment and rehabilitation protocols involving “core” stability exercises to improve spinal stability and function while eliminating pain. Yoga is derived from Sanskrit root “yuj” meaning “to control” or “to unite.” Regular practice of any form of yoga helps in establishing natural harmony and functional balance between various organ systems, leading to better health and a feeling of well-being. Yoga has traditionally been viewed as a relatively safe form of exercise. The practice of yoga poses, or asanas, was developed as an approach to align, strengthen, and balance the structure of the body. Further, it has been used to enhance dynamic control of core stabilizing muscles to reduce lower back pain (LBP), through increased hip  and spinal flexibility. Yoga postures comprise simple body movements such as standing, sitting, forward and backbend, twist, inversion, and laying down in supine position. Various yogic postures and exercises have been shown to activate specific muscles. Muscle activation is generally quantified through the use of the electromyogram (EMG) which produces signals proportional to the tension developed in muscle during use. These signals are most commonly normalized to maximum voluntary isometric contraction (MVIC) for the specific muscle under study. Ni et al.,12] studied EMG variation in specific core muscles such as rectus abdominis (RA), longissimus thoracis (LT), external oblique (EO), and gluteus maximus (GM) in various yogic poses and found that activation patterns of EO muscles are significantly higher in Chaturanga Dandasana, a specific yogic posture/asana compared to other asanas. Therefore, the knowledge of muscle activation in different yogic posture and exercise can be used for designing safe and effective yoga intervention for MSDs. In spite of the wide spectrum significance of this topic, very little research studies are available in the literature that addresses this issue. In this article, specific core muscle activation in different yogic posture has been discussed, which can be used for designing safe and effective evidence-based yoga intervention and rehabilitation program. Furthermore, the knowledge of functional anatomy will not only enhance yoga performance but also may help to reduce yoga-related injuries. Such knowledge will benefit all yoga practitioners, physiotherapist, researchers, and teachers. Therefore, the purpose of this article is to review current literature, to extract studies showing core muscle activation pattern in different yogic postures and correlate with functional anatomy. The hypothesis is that the different yogic postures might be linked to specific muscle activation pattern and implementation of this knowledge may be used for designing evidenced-based yoga programs for the treatment of MSDs and can help guide clinical decision-making for injury-related rehabilitation programs. The literature search was performed using the following electronic database: Cochrane Library, PubMed, Google Scholar, EMBASE, and web of science. The search terms used contained: Core muscle activation and yoga posture OR yoga and rehabilitation OR Intervention AND Electromyography. The articles which met the following criteria were included in the current review: (1) Studies were published in English, (2) article had to be peer reviewed, and (3) yoga and physical exercise module was used as an intervention treatment for the experimental group. Some of the studies included did not have any direct correlation with yogic asana. Therefore, the exercise mentioned in the selected studies was compared to similar yogic asana/exercise and correlated with functional anatomy, based on available literature and the author's knowledge of various asana. The most important function of abdominal muscle is to stabilize the spine. Abdominal muscles may be categorized into two groups: The stabilizers and the mobilizers. The stabilizers include transverses abdominis (TrAb) and internal oblique (IO), and the mobilizers include RA and EO. These muscles together are responsible for producing gross movement of trunk and pelvis. EO arises from eight fleshy slips in the outer surface (middle of the shaft) of lower eight ribs. The posterior-most fibers pass vertically downward and are inserted on the outer lip of the anterior two-third of the iliac crest. The remaining fibers pass downward, forward, and medially and end as a broad aponeurosis, which is inserted into the linea alba extending from xiphoid process to pubic symphysis [Figure 2]. Ni et al. observed variation in RA, LT, EO, and GM muscle firing patterns during various yogic postures and found that EMG amplitude for EO was significantly higher in Chaturanga Dandasana (0.784% ± 0.097% MVIC) and Adho Mukha Svanasana (0.383 ± 0.087 MVIC). In another study lead by Ekstrom et al., EO had the greatest activity with side bridge exercise (similar to Vasisthasana) (69% ± 26%, MVIC). Okubo et al. found highest bilateral, symmetrical level of activation of EO during elbow–toe exercise (similar to forearm Chaturanga Dandasana). The levels peaked when the contralateral arm and leg were lifted off the supporting surface. Escamilla et al. examined core muscle recruitment during various types of swiss ball abdominal exercises and traditional abdominal exercises. EMG signals during the roll-out and pike exercise for EO (46% and 84% MVIC, respectively) were significantly greater compared to most other exercises. The IO [Figure 2] is attached below to the inguinal ligament and the iliac crest, posteriorly to the thoracolumbar fascia, above to the lower four ribs, and anteriorly continuing as a broad aponeurosis. In trunk rotation, exercises such as Parivrtta Trikonasana, unilateral contraction of IO draws the opposite shoulder forward and bends the trunk laterally. This creates a “wringing” effect on the abdominal organs which helps to flush the liver and other organs and accelerate the removal of toxins. This is also important for maintaining core musculature. RA [Figure 2] is located anteriorly and originate bilaterally from the pubic symphysis, pubic crest and is inserted on the xiphoid process, and the cartilage of 5th, 6th, and 7th ribs. Ability to perform back-bending posture is an indicator of healthy core musculature. Generally, back-bending yogic postures are limited by the tightness of RA. Hence, postures that will activate RA may help prevent MSDs. During the practice of Utthanasana, RA flexes the trunk forward, which is further accentuated by iliopsoas and quadriceps. Salem et al. studied the muscle activation pattern of gluteus medius (Glu Med), gastrocnemius, quadriceps, hamstrings, erector spinae (ES), and RA muscle in the Tree (Vakrasana), Warrior (Virabhadrasana), and Crescent (Anjaneyasana) poses. They found muscle activation pattern of RA is significantly increased in the Crescent pose (Anjaneyasana) (56.10%), followed by activation in Warrior pose (50.38%) and Tree pose (50.14%). Ekstrom et al. also demonstrated the muscle activation pattern of RA, EO, LT, GM, Glu Med, and hamstrings muscle in nine rehabilitation exercises. The activation pattern of RA was significantly higher in prone bridge (forearm Chaturanga Dandasana) (43% ± 21% MVIC) and side bridge (Vasisthasana) (34% ± 13% MVIC) exercises. Okubo et al. showed greatest RA activation during the curl-up exercise (similar to Navasana). Escamilla et al. studied the core muscle activation during different swiss ball and traditional abdominal exercises and found that EMG signals during the roll-out and pike exercise for upper RA (63% and 46% MVIC, respectively) and lower RA (53% and 55% MVIC, respectively) were greater compared to most other exercises. 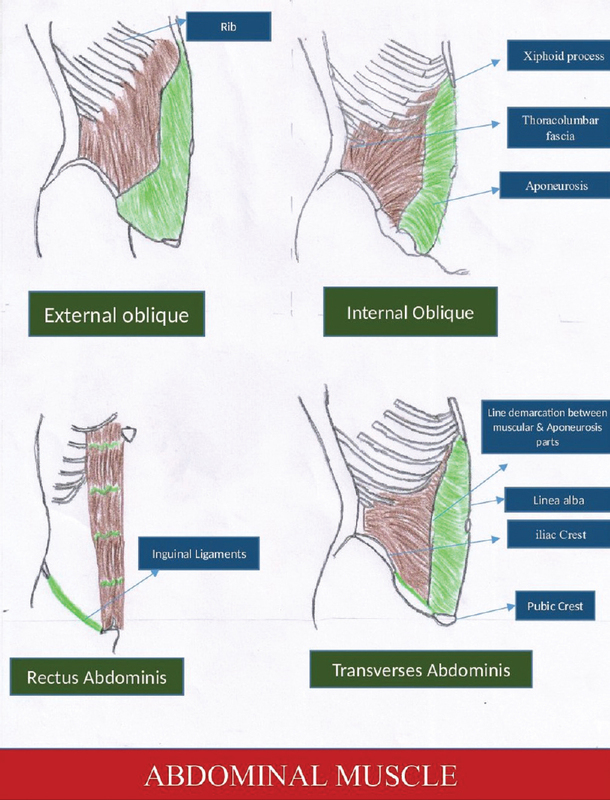 The TrAb [Figure 2] is the innermost of three flat abdominal muscles. The direction of most of its fibers is horizontal, and it arises from one-third of the upper surface of the inguinal ligament, anterior two-third of iliac crest, and the inner surface of the lower six ribs. These horizontal fibers are inserted into linea alba, extending from the xiphoid process to the pubic symphysis. The orientation of horizontal “belt-like” fibers limits its ability to generate motion and emphasizes its relationship to increasing intra-abdominal pressure (IAP), which is considered to have major effects on lumbo-pelvic stability. The contraction of TrAb reduces the diameter of the abdomen, and it pulls the belly inside toward the vertebral column, thereby increasing the lordosis of the lumbar spine. Lordosis makes the spine attain a natural position and is important for postural correction. The anticipatory contraction of the TrAb has been identified during the movements of extremities in healthy individuals  and is delayed in low back pain patients. Okubo et al. studied the muscle activation pattern in different lumbar stabilization exercises and observed that contralateral arm and leg lift (similar to four plank Chaturanga Dandasana) had marked effect on both right and left TrAb (41.8% ± 20.2% MVIC for right TrAb and 50.6% ± 28.4% MVIC for left TrAb). The Uddiyana Bandha (Retraction of abdomen, i.e., “drawing-in” of the abdomen or “abdominal hollowing”) is an ancient yoga practice which also affects the core. The “abdominal hollowing” is a suggested strategy to activate the “deep muscle corset” which aims to preferentially recruit the lower TrAb, while minimally contracting the obliques. When the “abdominal hollowing” is underactive, the abdomen protrudes, and the natural spino-pelvic posture is lost, thus resulting in faulty postures. Omkar et al. observed using ultrasound imaging technique that the thickness of TrAb is increased from 10.5 to 17.5 mm during the practice of Uddiyana Bandha. Hides et al. studied the function of the TrAb muscle during “drawing-in” of the abdominal wall using magnetic resonance imaging techniques. They found that TrAb contracted bilaterally to form a musculofascial band that tightened like a corset, which increases the transverse tension, thereby correcting the problem related to postural pathomechanics. The magnitude of the IAP is increased, resulting in a greater IAP generated torque about lumbar disc which help unload the spine. Therefore, the Uddiyana Bandha could be included as an essential part of core stability training. Weak and unresponsive abdominal muscles of the core lead to excessive anterior pelvic tilt which risks injuries to the lumbar spine and disc causing pain in the lower extremities. Thus, the practice of above-mentioned yogic asanas can be exploited for strengthening of abdominal muscles in preventive and rehabilitative services. The imbalance of the hip musculature involved in the movement of hip girdle is frequently seen in people with complaints of LBP. Gluteal muscle weakness has also been seen in several injuries related to lower extremities including patellofemoral pain syndrome, iliotibial band friction syndrome, anterior cruciate ligament sprain, and chronic ankle instability. Weakness of gluteal muscle results in injuries of the lower extremities by influencing joint loading patterns and lower extremity control. Improving gluteal strength and activation may be a critical aspect of rehabilitation. The GM [Figure 3] is the strongest hip musculature of the body. It plays an important role in pelvic and spinal stabilization. It is often used to accelerate the body upward and forward from a position of hip flexion. The GM arises from the outer surface of the ilium, posterior surface of the sacrum and coccyx and is inserted in the gluteal tuberosity and iliotibial tract [Figure 2]. The GM muscles work along with its “synergistic” muscles to maintain the correct posture. The semitendinosus (ST), semimembranosus (SM), and Biceps Femoris (BF) are the synergist muscles of the GM and iliopsoas, whereas pectineus and rectus femoris are the antagonistic muscles of the GM. Many important yogic postures including standing pose, backbends, and forward bends activate GM. Tightness of GM limits forward bends and weakness limits backbends. Ni et al. observed maximum GM activity in Virabhadrasana-1 (back). Queiroz et al. studied muscle activation pattern variation in various pelvic and trunk positions in knee stretch exercises and found that exercises involving pelvic retroversion and trunk flexion, resembling Vyaghrasana, consistently increased GM activity compared to other trunk and pelvis positions. Ekstrom et al. studied the muscle activities of RA, EO, LT, GM, Glu Med, and hamstring in nine rehabilitation exercises and reported that the muscle activation pattern of GM had significantly greater activation with the quadruped arm/lower extremity lift (similar to variation of Marjariasana) (56% ± 22% MVIC). Distefano et al. studied gluteal muscle activation during common therapeutic exercises and reported that GM activation during the single-limb squat and single-limb deadlift (as in Virabhadrasana) was significantly greater than during the lateral band walk (27% ± 16% MVIC), hip clam (34% ± 27% MVIC), and hop forward exercises (35% ± 22% MVIC). Farrokhi et al. also found GM activation was highest when the subjects performed a forward lunge with flexed forward (Low Anjaneyasana) (22% MVIC) relative to the hip and pelvis. Reiman et al. observed GM and Glu Med activation during rehabilitation exercise in both patients with LBP and in patients with lower extremity pathology. They found GM activation during the single-limb deadlift (59% ± 28% MVIC) was significantly greater than other rehabilitation exercise modules, and Glu Med activation during side bridge (74% ± 30% MVIC) was significantly higher than other rehabilitation exercise modules. Glu Med [Figure 3] is the abductor of the hip joint which originates on the outer surface of ilium below the iliac crest and anterior to the GM and is inserted on the tip of the greater trochanter. The gluteus minimus, tensor fascia lata, and Piriformis are the synergist muscle, and adductor groups are the antagonistic muscle of Glu Med. Glu Med is commonly activated during walking. As the weight of the body is suspended on one leg, these muscles prevent the opposite hip from sagging. Weakness in this muscle can result in “Trendelenburg” gait, in which the individuals' opposite hip sag upon weight-bearing hip. Fall while walking, a common feature in the old age, is generally due to weakness of the Glu Med. Weakness in Glu Med also limits standing pose on one leg (Utthita Hasta Padangustasana). Similarly, tightness in the Glu Med limits yogic postures that require extensive external rotation of the femur at the hip (Padmasana). Ekstrom et al. studied RA, EO, LT, GM, Glu Med, and hamstrings muscle in nine rehabilitation exercise for spine, hip, and knee which are important for core stabilization. They observed that Glu Med showed greater activation with the side bridge posture (Vasisthasana) (74% ± 30% MVIC). Yu et al. studied physical demands of Vriksasana and Utthita Hasta Padangustasana pose when performed by geriatric patients and showed that the average EMG activity of Glu Med in Vakrasana was 32.15% ± 7.13% MVIC and Utthita Hasta Padangustasana was 44.28% ± 6.38% MVIC. Wang et al. studied the biomechanical demands of standing yogic postures in elderly and showed that average EMG signals of hamstring was significantly higher in the one leg balance posture (Utthita Hasta Padangustasana) (85.9% ± 112.0% MVIC) and tree pose (Vriksasana) (37.9% ± 25.2% MVIC). Distefano et al. studied gluteal muscle activation during common therapeutic exercises used in rehabilitation and injuries prevention programs and observed that Glu Med activity was significantly greater during side-lying hip abduction posture (similar to variation of Vasisthasana) (81% ± 42% MVIC) compared to hip clam (40% ± 38% MVIC), lunges (48% ± 21% MVIC), and hop (48% ± 25% MVIC) exercises. Oliver et al. studied select muscle activation during isometric core exercises and showed that Glu Med activity was significantly higher in abdominal bridge with one leg support (similar to a variation of Setu Bandhasana). Hip dysfunction, which results in weakness and limited range of motion, is one of the causes for LBP and various pathologies of lower extremities involving the knee. The practice of the above-mentioned yogic asana may minimize the possibility of these injuries by activating the specific hip musculature and can be used as the therapeutic yoga protocol for various MSDs. The core muscle can also influence hamstring muscle function. Reduced extensibility of the hamstrings has been proposed as a predisposing factor for injuries. 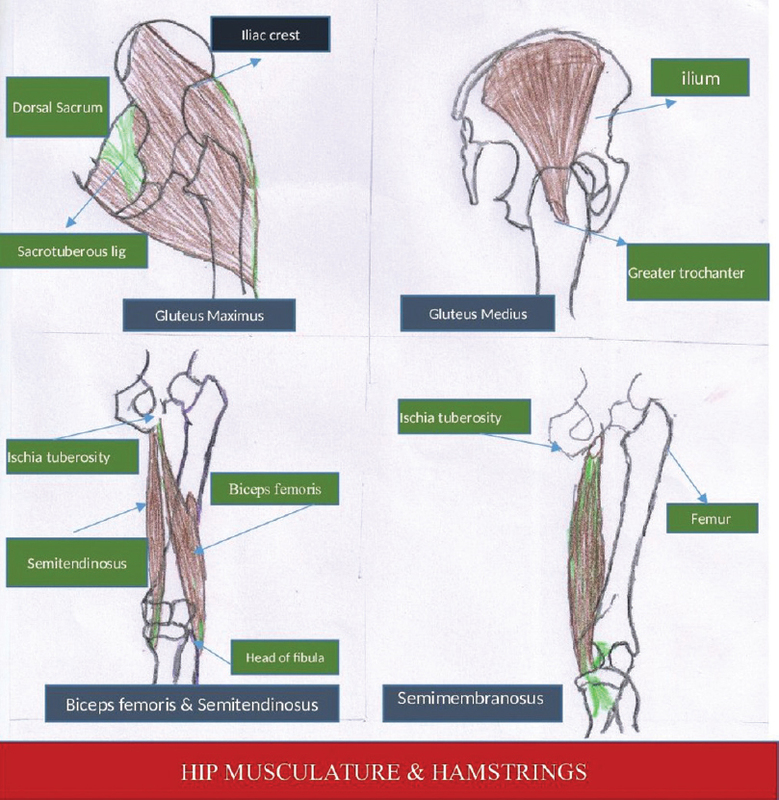 Hamstrings are composed of three muscles [Figure 3] in the posterior aspect of thigh: (1) BF, (2) ST, and (3) SM. The hamstrings are responsible for actions at the hip and knee as their attachments cross both joints. This muscle group is typically known for producing flexion of knee, but by flexing the trunk and extending the knee, the hamstrings are also powerful hip extensors. They arise from the ischial tuberosity and are inserted into one of the bones of the leg. The quadriceps and iliopsoas are the antagonists and GM, sartorius, gracilis, and gastrocnemius are the synergists of the hamstrings. Shortening of hamstrings occurs from continuous sitting and can be described as a “computer-desk sitting” syndrome. Shortened hamstrings have a negative effect on mobility of the pelvis and the lumbar spine which leads to difficulty in maintaining a full sitting position in Dandasana. This results from a functional limitation in the hamstring muscles which cause the pelvis to tilt backward and lumbar lordosis to flatten. The contraction of the hamstrings facilitates the stretching of iliopsoas and quadriceps muscle which is observed in the practice of Shalabhasana. The contraction of the antagonistic muscle of hamstrings tilts the pelvis forwards and thus draws the origin of the muscle away from the insertion which accentuates the hamstring stretch. Such activation is seen during the practice of Padahastasana. Ekstrom et al. who studied the muscle activation pattern in various muscles in rehabilitation exercise modules, noted that the muscle activation pattern of hamstring is significantly higher in the unilateral bridge (similar to a variation of Setu Bandhasana) (40% ± 17% MVIC) and Quadruped arm/lower extremity lift (similar to a variation of Marjariasana) (39% ± 14% MVIC). Ni et al. also compared muscle activation patterns in 14 dominant side muscles during different yogic poses across three skill levels and noticed that the BF produced significantly higher EMG signals during Utkatasana, Urdhva Mukha Svanasana, Dandasana, Chaturanga Dandasana, and Virabhadrasana-1 than Utthanasana. Yu et al. studied the physical demands of Vriksana and Utthita Hasta Padangustasana pose performed by elderly and showed that average EMG signals of hamstrings in Vriksasana were 48.05% ± 10.60% MVIC and in Utthita Hasta Padangustasana was 94.78% ± 13.55% MVIC. Wang et al. also studied the biomechanical demands of standing yogic poses in elderly and showed that average EMG activity of hamstring was significantly higher in the one leg balance posture (Utthita Hasta Padangustasana) (85.9% ± 112.0% MVIC). As the hamstrings muscle resists the possibility of detrimental motions, improving its strength and activation through yogic posture as described above can be a critical aspect of rehabilitation and injury programs. The back muscle is an important muscle of trunk, and it controls a range of motion, generates movement, and provides gross stability. The trunk control is the main center of the body for prevention and rehabilitation of chronic LBP. Renkawitz et al. noticed imbalanced pattern of LT activity and reduced trunk extension strength among patients with LBP. 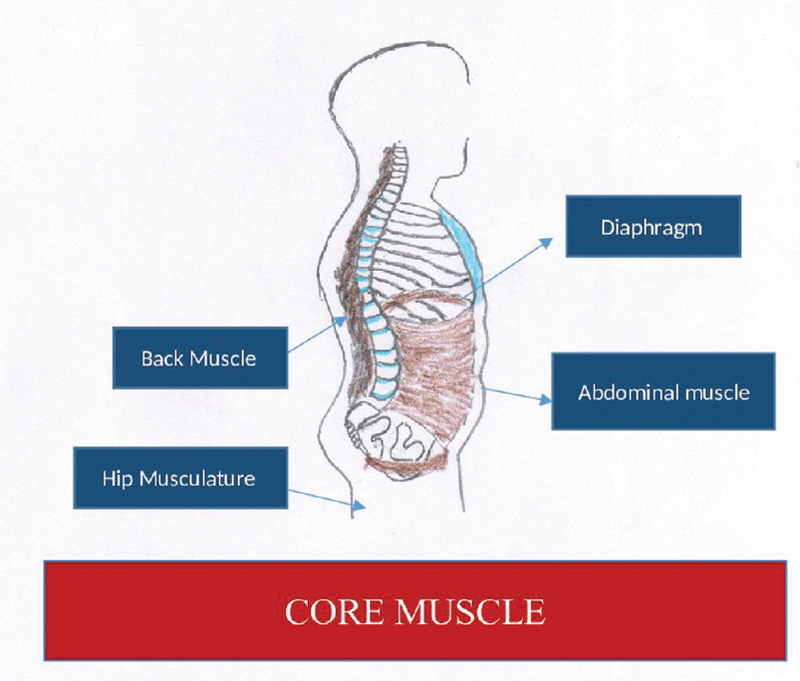 The back muscles of the core include ES and multifidus (MF). ES is a group of posterior spinal muscle which is continuous from the sacrum to the occiput, and together they are involved in vertebral extension. The alignment of ES from medial to lateral is spinales (runs up the center of the back from one vertebral spinous process to the next spinous process), LT (are lateral and run from one vertebral transverse process to next transverse process), and iliocostalis (IC) (are the most lateral and run from one rib to the next rib). The ES muscle groups are identified from head to sacrum as capitis, cervicis, thoracis, and lumborum. 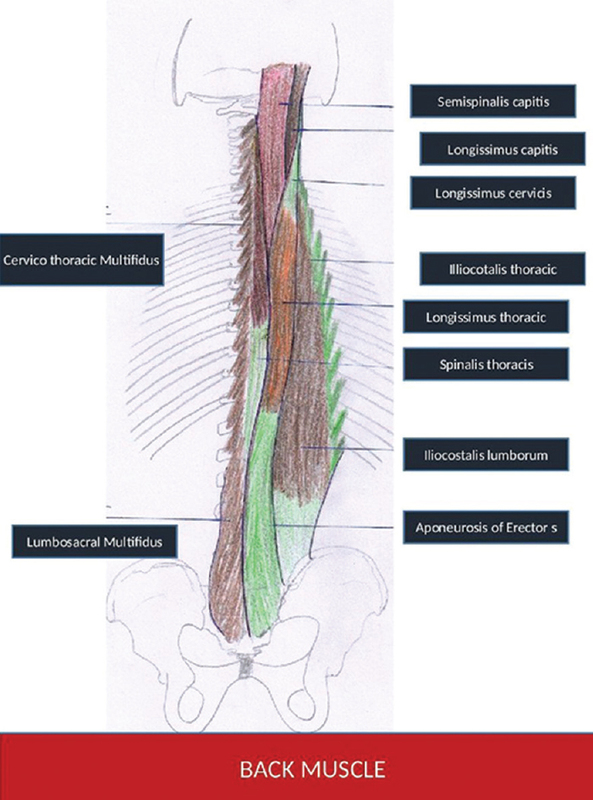 The thoracis and lumborum parts of the ES form the posterior aspect of the core [Figure 4]. Tadasana causes contraction of these muscles causing the spine to straighten. Utthita Trikonasana contracts the laterally placed LT and IC causing lateral bending of spine. The forward bends, such as Uttanasana, stretch these muscles and the backbends (Bhujangasana) strengthen these muscles. Deep to the ES which includes spinalis, LT, and IC, lies the quadratus lumborum (QL) which originate from the posterior iliac crest and inserts on the lower border of 12th rib and transverse process of lumbar vertebra 1 through 4. Contraction of the QL unilaterally flexes the trunk to the side in Utthita Trikonasana. Urdhva Dhanurasana contracts the QL which extends the lumbar spine. The functional shortening of QL is a common problem associated with sedentary lifestyle postures, and it limits the range of flexion in lumbar vertebra. Shortening of QL increases lumbar lordosis which is reflected as functional stiffness of the lower back and a lack of up- and down-flow of movement. It becomes difficult to raise the pelvis off the ground and rounding the back. This is important for standing in an erect posture. Ni et al. who studied core muscle activation pattern in different yoga poses observed that back muscle activation pattern of ES is significantly higher in Utthanasana, Urdhva Mukha Utthanasana, Urdhva Mukha Svanasana, Virabhadrasana (nondominant), and Virabhadrasana (dominant) than Adho Mukha Svanasana. Ekstrom et al. observed significantly higher muscle activation pattern of LT in the unilateral bridge (similar to variation of Setu Bandhasana) (36% ± 18% MVIC) and quadruped side bridge (similar to Vasisthasana) (39% ± 14% MVIC). Similarly, Salem et al. found maximum LT activity in Adho Mukha Svanasana with wall support and Utkatasana. Okubo et al. found that the exercises performed in supine position generated a higher activity level of ES, as compared to those performed in the prone position. However, this activation showed a statistically significant amount of asymmetry between sides (right side, 30% MVC and left side, 10% MVC). MF consists of a number of fleshy and tendinous fasciculi which fill up the groove on either side of the spinous processes of vertebra from sacrum to the axis. MF helps to take pressure off the vertebral discs so that our body weight can be well distributed along the spine. In addition, MF contributes to stability of spine. MF muscles are recruited during many actions in our daily lives, which involve bending backward, sideways, and even turning to the side. Studies by Danneels et al. have shown that MF get activated before any action is carried out, thus protecting the spine from injury. Okubo et al., too, studied EMG signals of TrAb and MF using wire electrodes, during lumbar stabilization exercises and found that the back bridge with right leg lift exercise (similar to variation of Setu Bandhasana) produced the highest activity in MF (51.7% ± 34.0% MVIC). Stevens et al. reported that the MF muscle activity increased in ipsilateral bridge (23.54% MVIC) and contralateral bridge (24.58% MVIC) (variation of Setu Bandhasana) postures. Weakness of the trunk musculature is seen in various MSDs, and therefore, practice of above-mentioned yoga asanas which activate specific trunk musculature may be used for therapeutic interventions. The relationship between the functional core anatomic architectural analysis and its activation in different yogic posture and exercise has a wide spectrum of clinical relevance. Knowledge of activation magnitudes of muscles in various yogic postures [Table 1] can assist health-care practitioners to make appropriate decisions for intervention. This knowledge should help reduce yoga-related injuries and prevent MSDs. McGill SM. A revised anatomical model of the abdominal musculature for torso flexion efforts. J Biomech 1996;29:973-7. Beckman SM, Buchanan TS. Ankle inversion injury and hypermobility: Effect on hip and ankle muscle electromyography onset latency. Arch Phys Med Rehabil 1995;76:1138-43. Nadler SF, Malanga GA, Feinberg JH, Prybicien M, Stitik TP, DePrince M. Relationship between hip muscle imbalance and occurrence of low back pain in collegiate athletes: A prospective study. Am J Phys Med Rehabil 2001;80:572-7. Richardson C, Jull G, Hodges P, Hides J. Therapeutic Exercise for Spinal Segmental Stabilization in Low Back Pain: Scientific Basis and Clinical Approach. New York: Churchill Livingstone; 1999. Kibler WB, Press J, Sciascia A. The role of core stability in athletic function. Sports Med 2006;36:189-98. Cramer H, Lauche R, Haller H, Dobos G. A systematic review and meta-analysis of yoga for low back pain. Clin J Pain 2013;29:450-60. Williams K, Abildso C, Steinberg L, Doyle E, Epstein B, Smith D, et al. Evaluation of the effectiveness and efficacy of Iyengar yoga therapy on chronic low back pain. Spine (Phila Pa 1976) 2009;34:2066-76. Galantino ML, Bzdewka TM, Eissler-Russo JL, Holbrook ML, Mogck EP, Geigle P, et al. The impact of modified Hatha yoga on chronic low back pain: A pilot study. Altern Ther Health Med 2004;10:56-9. Ni M, Mooney K, Harriell K, Balachandran A, Signorile J. Core muscle function during specific yoga poses. Complement Ther Med 2014;22:235-43. Richardson C, Jull G, Toppenberg R, Comerford M. Techniques for active lumbar stabilisation for spinal protection: A pilot study. Aust J Physiother 1992;38:105-12. Ekstrom RA, Donatelli RA, Carp KC. Electromyographic analysis of core trunk, hip, and thigh muscles during 9 rehabilitation exercises. J Orthop Sports Phys Ther 2007;37:754-62. Okubo Y, Kaneoka K, Imai A, Shiina I, Tatsumura M, Izumi S, et al. Electromyographic analysis of transversus abdominis and lumbar multifidus using wire electrodes during lumbar stabilization exercises. J Orthop Sports Phys Ther 2010;40:743-50. Escamilla RF, Lewis C, Bell D, Bramblet G, Daffron J, Lambert S, et al. Core muscle activation during Swiss ball and traditional abdominal exercises. J Orthop Sports Phys Ther 2010;40:265-76. Salem GJ, Yu SS, Wang MY, Samarawickrame S, Hashish R, Azen SP, et al. Physical demand profiles of hatha yoga postures performed by older adults. Evid Based Complement Alternat Med 2013;2013:165763. Daggfeldt K, Thorstensson A. The mechanics of back-extensor torque production about the lumbar spine. J Biomech 2003;36:815-25. Hodges PW, Richardson CA. Contraction of the abdominal muscles associated with movement of the lower limb. Phys Ther 1997;77:132-42. Hodges PW, Richardson CA. Delayed postural contraction of transversus abdominis in low back pain associated with movement of the lower limb. J Spinal Disord 1998;11:46-56. Omkar SN, Vishwas S, Tech B. Yoga techniques as a means of core stability training. J Bodyw Mov Ther 2009;13:98-103. Hides J, Wilson S, Stanton W, McMahon S, Keto H, McMahon K, et al. An MRI investigation into the function of the transversus abdominis muscle during “drawing-in” of the abdominal wall. Spine (Phila Pa 1976) 2006;31:E175-8. Robinson RL, Nee RJ. Analysis of hip strength in females seeking physical therapy treatment for unilateral patellofemoral pain syndrome. J Orthop Sports Phys Ther 2007;37:232-8. Hewett TE, Myer GD, Ford KR. Anterior cruciate ligament injuries in female athletes: Part 1, mechanisms and risk factors. Am J Sports Med 2006;34:299-311. Friel K, McLean N, Myers C, Caceres M. Ipsilateral hip abductor weakness after inversion ankle sprain. J Athl Train 2006;41:74-8. Powers CM. The influence of altered lower-extremity kinematics on patellofemoral joint dysfunction: A theoretical perspective. J Orthop Sports Phys Ther 2003;33:639-46. Vakos JP, Nitz AJ, Threlkeld AJ, Shapiro R, Horn T. Electromyographic activity of selected trunk and hip muscles during a squat lift. Effect of varying the lumbar posture. Spine (Phila Pa 1976) 1994;19:687-95. Queiroz BC, Cagliari MF, Amorim CF, Sacco IC. Muscle activation during four Pilates core stability exercises in quadruped position. Arch Phys Med Rehabil 2010;91:86-92. Distefano LJ, Blackburn JT, Marshall SW, Padua DA. Gluteal muscle activation during common therapeutic exercises. J Orthop Sports Phys Ther 2009;39:532-40. Farrokhi S, Pollard CD, Souza RB, Chen YJ, Reischl S, Powers CM. Trunk position influences the kinematics, kinetics, and muscle activity of the lead lower extremity during the forward lunge exercise. J Orthop Sports Phys Ther 2008;38:403-9. Reiman MP, Bolgla LA, Loudon JK. A literature review of studies evaluating gluteus maximus and gluteus medius activation during rehabilitation exercises. Physiother Theory Pract 2012;28:257-68. Yu SS, Wang MY, Samarawickrame S, Hashish R, Kazadi L, Greendale GA, et al. The physical demands of the tree (Vriksasana) and one-leg balance (utthita hasta padangusthasana) poses performed by seniors: A biomechanical examination. Evid Based Complement Alternat Med 2012;2012:971896. Wang MY, Yu SS, Hashish R, Samarawickrame SD, Kazadi L, Greendale GA, et al. The biomechanical demands of standing yoga poses in seniors: The Yoga empowers seniors study (YESS). BMC Complement Altern Med 2013;13:8. Oliver GD, Stone AJ, Plummer H. Electromyographic examination of selected muscle activation during isometric core exercises. Clin J Sport Med 2010;20:452-7. Hartig DE, Henderson JM. Increasing hamstring flexibility decreases lower extremity overuse injuries in military basic trainees. Am J Sports Med 1999;27:173-6. Renkawitz T, Boluki D, Grifka J. The association of low back pain, neuromuscular imbalance, and trunk extension strength in athletes. Spine J 2006;6:673-83. Danneels LA, Coorevits PL, Cools AM, Vanderstraeten GG, Cambier DC, Witvrouw EE, et al. Differences in electromyographic activity in the multifidus muscle and the iliocostalis lumborum between healthy subjects and patients with sub-acute and chronic low back pain. Eur Spine J 2002;11:13-9. Stevens VK, Bouche KG, Mahieu NN, Coorevits PL, Vanderstraeten GG, Danneels LA. Trunk muscle activity in healthy subjects during bridging stabilization exercises. BMC Musculoskelet Disord 2006;7:75.